The high tech engine powering the 370Z is known as the VQ37VHR, this is the 4th and latest version of Nissan's venerable multiple award winning VQ engine family. 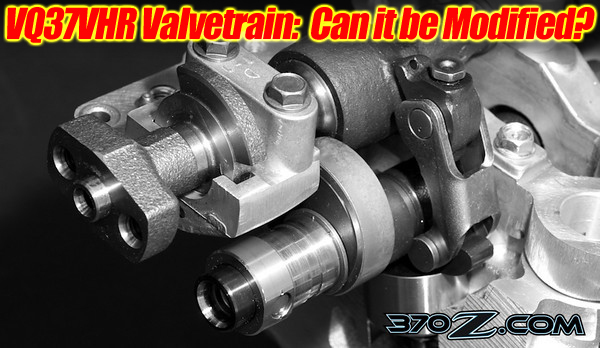 The VQ37VHR's most noted and hard to understand features are VVEL and CVTC, a jaw hurting mouthful of acronyms standing for Variable Valve Event and Lift with Continually Variable Timing Cam, whew. The advanced valvetrain features computer controlled continually variable valve duration, lift and phasing. These variable are changed continually on the fly by an independent computer linked to the engines ECU via a CANBUS LAN network. The CVTC phasing control for the intake cam is not new technology for the VQ engine, being used for the VQ35 Rev Up spec engine found in the 2003 and later G35 and 350Z as well as the VQ35HR engine last used in the late 350Z. CVTC technology is also used in many other Nissan engines and models from the QR25DE 4 cylinders to the VK series V-8’s. CVTC is integrated into the intake cam sprocket. It consists of a vane equipped inner rotor attached to the intake cam which is free to rotate within a housing machined into the intake cam gear. A pulse width modulated solenoid controlled by the engines ECU meters pressurized oil from the engines oil pump to the vaned chamber in the gear. As oil is let into the chamber, it moves the vanes with the engines rotation and advances the cam. When the ECU wants to retard the cam, it meters the oil draining out of the chamber allowing the cam to retard. By metering the inlet and outlet oil flow, the advance and retard of the intake cams can be controlled in a stepless manor. The CVTC system has a comand authority of 37 degrees and the mechanical capabilty to move 39 degrees on the older versions of the VQ engine. The VQ37VHR has a larger control range which we havent determined yet but we will look colosely into this soon. Since this is known and well understood technology, we won’t get into it too far here but will focus instead on VVEL. The unique VVEL system completely controls the intake valves opening and closing events. The VVEL system is exceedingly complicated using two separate rotating shafts driving links that operate eccentrics activating a valve activating reciprocating rocker arm that takes the place of the traditional cam lobe. The rocker slides back and forth on the valves conventional cam follower to open and close the valves. The rocker is equipped with a moving fulcrum which can quickly change the motion ratio of the eccentric to the rocker. The fulcrum position is controlled by a powerful stepper motor controlled by the VVEL computer. This Rube Goldberg-like system of linkages and shafts gives the ability to steplessly change the duration and lift of the intake valves quickly on the fly. The command authority of the VVEL system is great enough so controlling valve opening is the primary means of throttling the VQ37VHR’s output, instead of traditional throttle plates. Amazing article! Talk about super in depth tech. of a brand new motor. Where else can you get this much detail and insight in to what this motor holds? Good to know that my 370Z is considered green.